i love picking out a good gift, but i wanted to try and make a few this year, too. 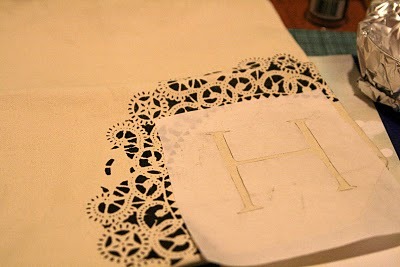 i was totally in love with this project on design*sponge and decided to give it a go. 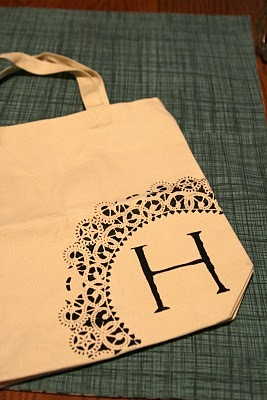 first, i used a paper doily as a stencil for the lacy part. filled it in with fabric paint. 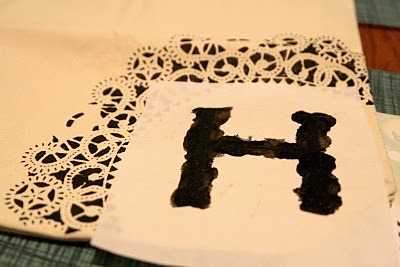 then i made a letter stencil out of freezer paper. 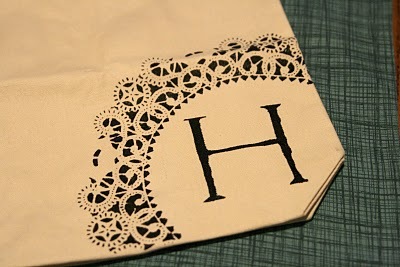 i ironed it on to the bag and then used fabric paint to fill in the letter. i should have let it dry a little longer. maybe the edges of the letter would have been cleaner that way. but i still think it turned out pretty well. my friend loved it!